The new 2.0-liter diesel engine coming from Volkswagen next year will be sold globally. VW will change only the emissions system. TRAVERSE CITY, Mich. -- Volkswagen plans to install a new 2.0-liter turbocharged diesel engine in Volkswagen brand and Audi models about a year from now that is cleaner, more powerful and more fuel efficient than the current motor. 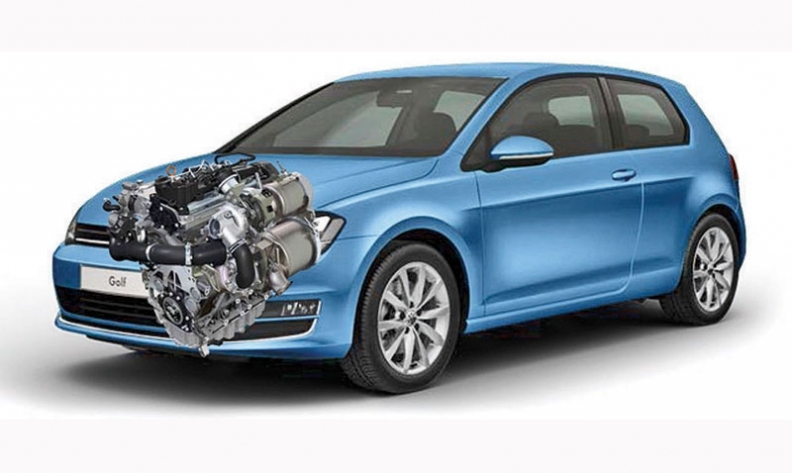 Oliver Schmidt, general manager of Volkswagen of America's energy and environmental office, confirmed the new engine this morning at the Advanced Powertrain Forum at the 2013 CAR Management Briefing Seminars. The new engine will be rated at 150 hp -- 10 more than the current engine -- and have the same 236 pounds-feet of torque as the current motor. It arrives just as other automakers are offering diesel engines to compete with Volkswagen, the longtime volume leader in car diesel sales in North America. Through July, the Volkswagen brand has sold 47,000 diesels in North America, or 78 percent of all car diesels. The new engine is expected to help VW reduce production costs because it is nearly identical to the diesel engines VW sells in other markets, Schmidt said. The North American version has a different emissions system geared to reduce oxides of nitrogen. The European version is tuned to reduce carbon dioxide, or CO2. "With the different emissions regulations, the engine sold in Europe could not be offered in the U.S. This made the engine expensive," Schmidt said about the outgoing diesel. "We did not want to do a specialized engine for the U.S. anymore. We wanted a base engine capable of meeting world standards with a scalable emissions system." VW engineers designed a new emissions system that packages the diesel particulate filter and selective catalytic reduction (SCR) system in one assembly. The SCR system injects urea into the exhaust to clean NOx or oxides of nitrogen from the exhaust. SCR is already used in VW's larger diesel vehicles, such as the Passat and Touareg, But when the new engine arrives in 2015 models, all VW diesels will use SCR. The system requires drivers to monitor the urea tank and keep it from running out. Schmidt said engineers made a number of changes inside the engine aimed at reducing friction. The new engine will be equipped with low-friction bearings, low-tension piston rings and a two-stage oil pump that varies the volume of oil, Schmidt said. But it is the emissions system that received the most attention. Schmidt said the new diesel engine will deliver better fuel economy than the current one, but he didn't say how much because final EPA testing is not done.